I am in the planning stages of the Metric Fantastic loop for Piggy's Revenge 2015.It looks like it will be exactly 62 miles long.Get ready for a great adventure through 3 wilderness areas. 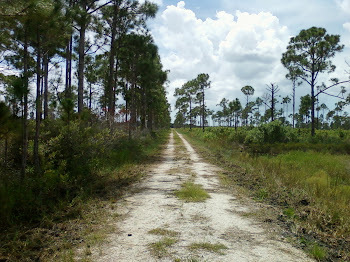 Two refueling stops are planned,one at 24 miles supplied by SCORR and you will pass a gas station at mile 46.There will be 15 miles of road riding (some are very poorly maintained roads), optional sidewalks, several water crossings,some sugar sand and swampy sections.The rest is gravel, grass covered double track and occasional pig ruts.There is no single track on this loop, making it more suitable to a monster cross bike or 29'er.Expect some surprises and WTF moments.This loop will not be marked for the most part and will require a GPS to find your way around.As usual you will be on your own. Now I am just waiting for things to dry up so I can preride the course and finalize the route. Next are the 20 and 40 mile off road loops.